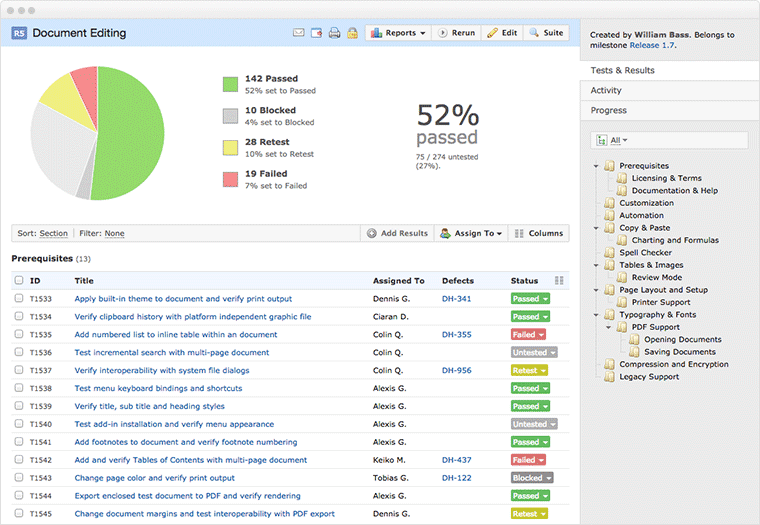 A powerful test case management application. How much does TestRail cost ? The pricing for TestRail starts at $25.0 per month. TestRail has 2 different plans such as - TestRail Cloud at $25.0 per month and TestRail Server at $240.0 per year. Cloud and SaaS edition hosted on fast and secure servers. Install TestRail on your own private server for full control. "Aesthetics need to mature but functionality is great." All the functionality of other products is there and test case writing is easy! Some pages don't look great, and it's sometimes unintuitive to know where I need to look for my tests. Give it time to get used to it. 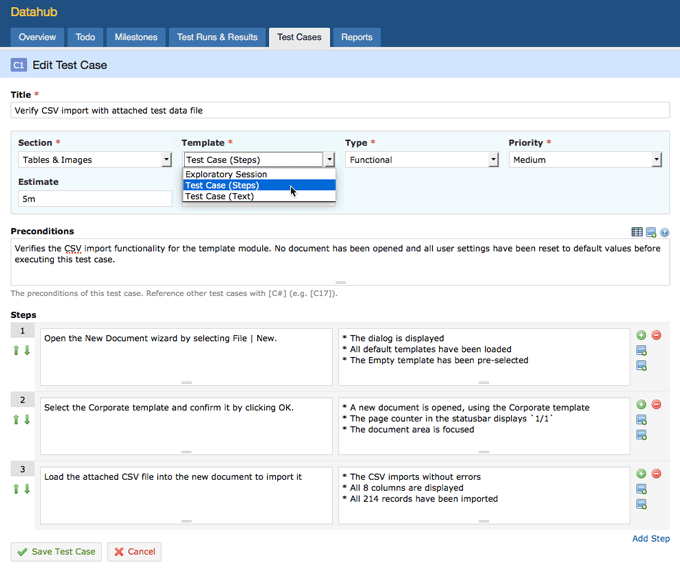 Organization and management of test cases, suites, etc. This is crucial to our business and the collaborative nature of testing. "Tool to marking test cases results"
I have used this tool in my organization to create the test plan and mark the test cases as passed, failed and blocked. This is a very simple and easy tool. I have found no issues while using this tool during testing. I would recommend to use this tool on regular basis to mark the test cases results and create the test plan. I have used this tool in my project work to create the test plan and mark the test cases results after executing the test plan. This tool is really helped me a lot during testing. 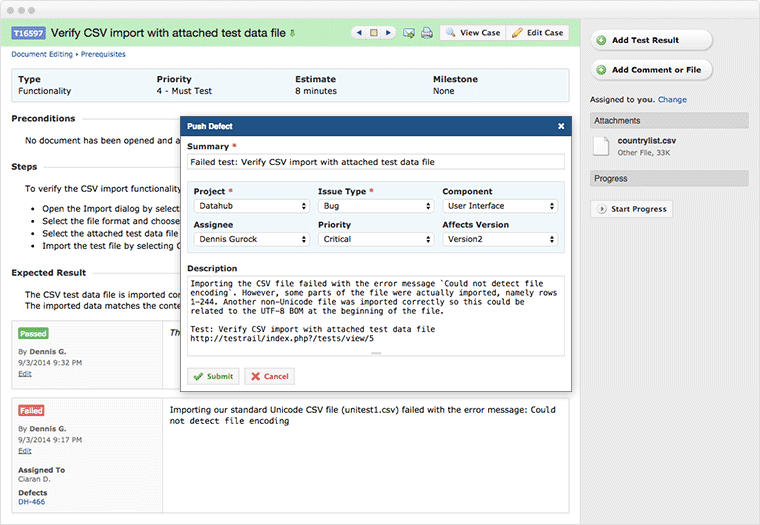 Pros: Easy to configure and use projects, testsuites and testcases. Can manage all projects independent. Integrations are easy for automatize testruns executions . Cons: I miss some integrations with others tools. Overall: We are using testrail to manage all of our core tests in the platforms and the experience is excelent. Cons: They give us percentage of testing progress, summary test report, easy to report about the testing result. Pros: It is very intuitive. 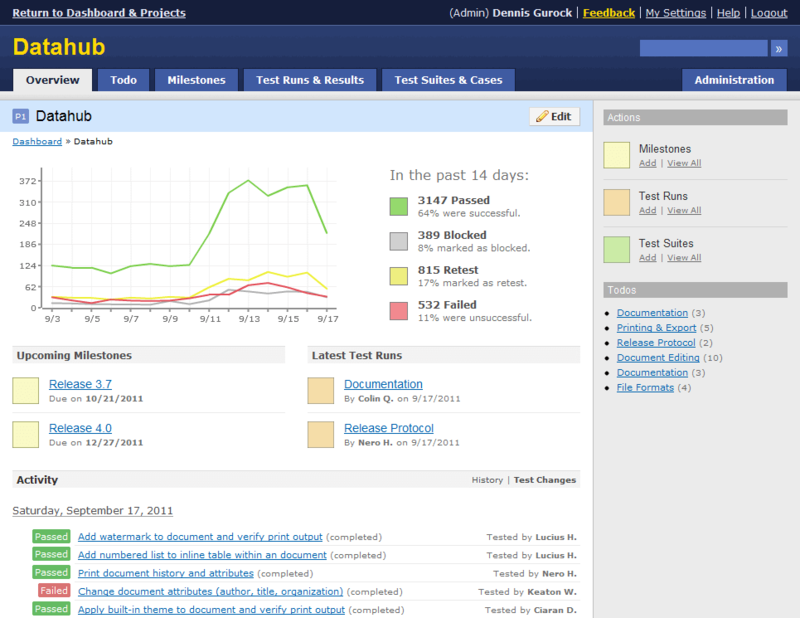 If one used other such tools for test documentation and tracking, it really very use to start with Test Rail. 2) Errors. Rather errors explanations. If possible to expand on what the exact issue is when we get an error. 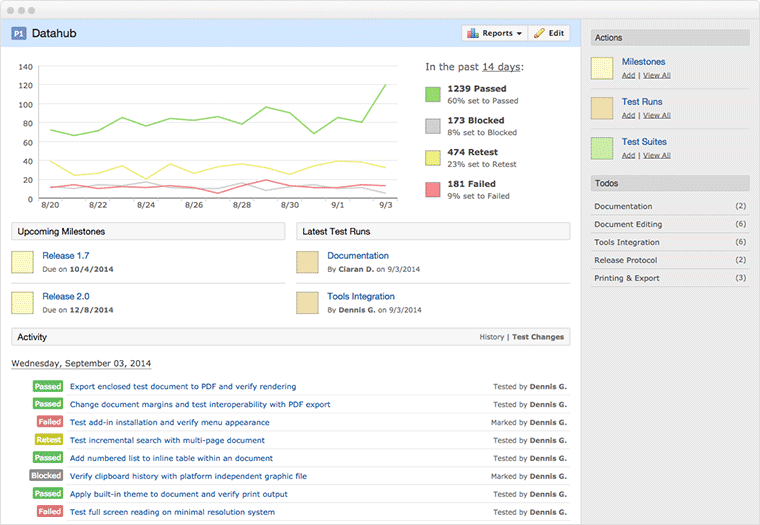 "Best tool to manage the test cases"
I have used this tool in my organization to create and mark test cases executed during test plan. It is a very simple and easy tool. We can mark the test cases based on the different results as passed, failed, blocked, not applicable and Ok but. I have seen nothing to be dislike while using this tool. I would recommend to use this tool on regular basis to create and mark the test cases during test plan execution. This is a very good tool which help in different aspects such as creation of test cases, managing test suits or test runs and extracting test reports. I have used this tool in my project work to create test cases and mark the status of executed test cases based on the different results. This tool really helped me in managing different test suites. It also provides us a dashboard facility which helped in managing different products. Pros: The reporting part is nice and easy to use. I can generate reports fast and I have the possibility to schedule the reports and to save them in a .pdf format for example. Cons: It is not cheap but also not expensive. The price per value is right. 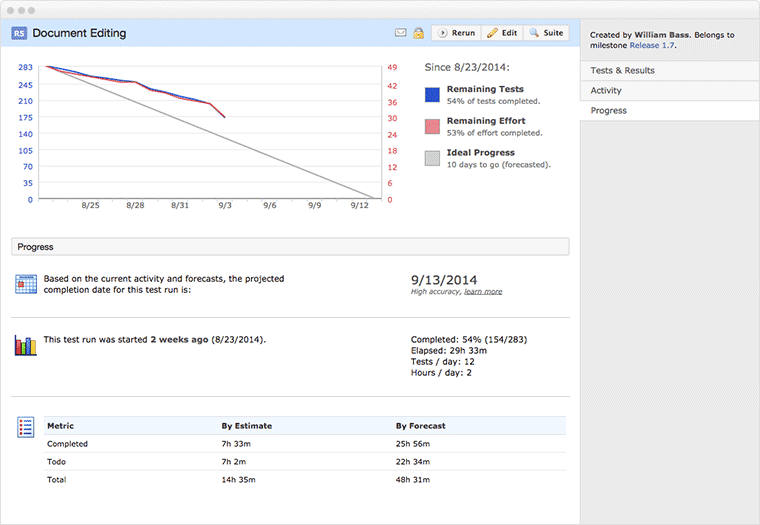 Overall: The TestRail is a cool test case management app that is easy to use and very customizable. It is nice that I have the possibility to make a push from TestRail to Jira and it is not necessary to log separately a bug and to make another list for tracking. Also, the reporting part is nice. There are also things to do, for example on the Filtering part for test cases. I want to have the possibility to count directly the selected test cases and also to apply a negative filter, for example, I want to select all test cases that are not updated by me and I don't have this possibility. But I can live with this. Pros: This software has been key in our regression testing. This helps us make sure our applications core features continue working as we add features. The API is great to use to for our automated testing. Cons: There is a learning curve on the terminology I feel. Test Runs And Test Suites and Test Plans etc. It makes sense after a while but takes some getting used to. Overall: Have a referenceable report on how our tests have passed have been create for management. Cons: Test Step and Test Result Definitions are not very "customizable"
Pros: TestRail Case managment software helps a lot with manage of the testing process. Cons: Missing possibility to set default tester per test case.